﻿ I should probably be getting some sleep, but I really want to write. I was thinking about something I wanted to write late last night when I heard a light knocking on my bedroom door. It was 12:09 am. Julie had driven down from Gainesville and wanted to know if by chance she was the first one to wish me happy birthday. She was, and I was so glad and excited to see her that it took me another hour or so to get to sleep. Or maybe it was the cup of coffee I’d had earlier. Either way, it was a good start to April 8, 2012. Church was good, not necessarily because the message was inspired or the service was awesome in any way but because I’ve been doing so much thinking, praying, conversing with God lately that I needed to express what I was feeling in an organized, public way. It felt good to have thought about what I was singing and to mean it. I love music. I think God would have let me be a musical Levite if I’d been an Israelite. 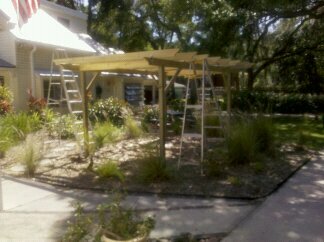 When we got back home after church, my men friends Carroll and Hector, were nearly finished putting up my pergola. A pergola is a fancy word for what Carroll calls a shade shed. I had asked if they would contribute the labor to make it as a birthday gift to me and they complied even though this was a busy week for them both. I was quite surprised that it worked out on time. It’s looking really good and needs just a few more braces and lattice on top. It’s my answer to “what to put in the front yard that won’t die from blistering heat”. The personal relationship side of this project was interesting to me. To watch Hector, who is a pretty skilled younger man, work patiently with Carroll, an 80 year old Cracker horse trainer with lots of experience building pole sheds, was amazing, amusing, and instructive. Clearly, I asked the right people to get this work done fast. It looks just like I imagined it would and I know I will enjoy it.Thanks guys.